Rotten Cheese! ~ Sardinia Baby! Casu marzu in Sardinian, or formaggio marcio, (rotten cheese) in Italian, is a traditional Sardinian sheep milk cheese of the Pecorino variety famous for containing the live larvae of insects. The cheese fly larvae (Piophila Casei) are deliberately introduced to the cheese prompting an advanced level of fermentation almost to the point of decomposition. The whole cheese is then left outside with part of the rind removed to allow the eggs to be laid inside. 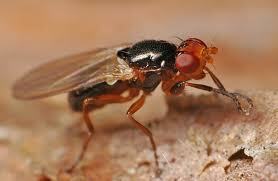 A female Piophila Casei can lay more than five hundred eggs at a time. The eggs hatch and the larvae begin to eat through the cheese with the acid from the maggots' digestive system breaking down the cheese fats. The cheese eventually becomes very soft with liquid called lagrima, (Latin for tear) oozing out. The larvae are almost transparent and white in colour and grow to about 8mm long. If annoyed they can launch themselves for a breath taking distance of up to 15cm! Because of these athletic capabilities consumers hold their hands above the sandwich to prevent the maggots from leaping. Those who can’t bare the thought of eating live maggots put the cheese in a sealed bag. Starved for oxygen the maggots squirm and jump in the bag creating a sound like rain. When the sound subsides the maggots are dead and the cheese can be eaten. Some people remove the larvae before eating the cheese but some don’t. 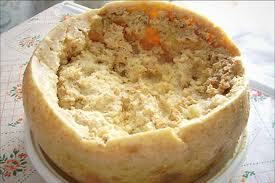 A typical Casu Marzu will contain thousands of maggots. The cheese is considered to be unsafe to eat by some Sardinians if the maggots in the cheese have died so the cheese is consumed when the maggots are still alive. Because of European Union food hygiene regulations the cheese was banned for a time but it was still possible to buy it on the black market where it could sell for double the price of an ordinary Pecorino. People found in possession of Casu Marzu would face heavy fines. The EU ban on Casu Marzu has now been lifted as the cheese is considered a "traditional" food made from a recipe that is thousands of years old and is therefore exempt from ordinary food hygiene regulations. Consumption of Casu Marzu is now believed to be safe. It is also considered to be an aphrodisiac but not recommended on first dates!